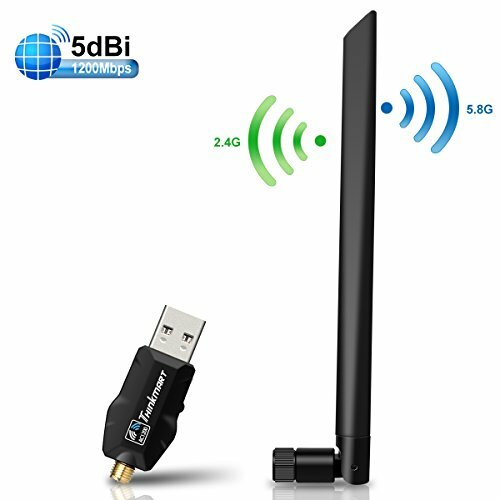 Upgrade to dual-band Wi-Fi with Thinkmart 1200Mbps Wireless USB Adapter.Plug this adapter into your desktop or laptop computer and delivers wi-fi connectivity up to 867Mbps on 5GHz bands, 300Mbps on 2.4GHz bands. Large, high gain antennas make it easier for USB adapters to get a signal even when there are multiple walls or floors between you and the router, which means less packet loss and a more reliable connection overall. USB 3.0 supports transfer rates of up to 5Gbps-10 times faster than USB 2.0. Provide faster and more efficient data transfer rates. Ultra-Speed WiFi Adapter: Speed of up to 1200Mbps (867Mbps over 5G + 300Mbps over 2.4G) for maximum performance, ideal for internet calling, HD video streaming, on-line gaming, etc. Ultra-Fast USB3.0 Port: USB3.0 interface for high-performance wireless networking with desktop laptop PCs, up to 10X times than USB2.0. If you have any questions about this product by Thinkmart, contact us by completing and submitting the form below. If you are looking for a specif part number, please include it with your message.